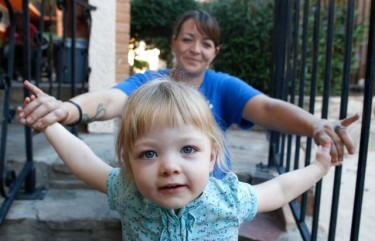 Abbie Ivy and her mom, Sherri, have been living at the Phoenix Dream Center since last spring. Sherri Ivy was just about to give in to substance abuse and walk away from her husband, Glenn, and two young daughters, when the Phoenix Dream Center plucked her family off the streets last spring and gave them hope for the future. Now, the couple are working on their marriage and other issues, they have obtained legal aid and health insurance, and their girls, 4-year-old Allie, and Abbie, 2, are enrolled in a Christian child-care center. It was all made available to them by the Dream Center, a volunteer nonprofit organization that each month serves about 40,000 homeless and low-income people, at-risk youth and struggling families. One of the center’s partners is Grand Canyon University, which on Friday hosted a family health fair that provided free services to about 80 people. It was at a similar health fair last summer that Glenn Ivy learned the important news that he had elevated blood pressure. The health fair was staffed by faculty members in the College of Nursing and Health Care Professions and the College of Humanities and Social Sciences, who supervised 20 nursing and counseling students. The students tested blood pressure, blood sugar and vision, measured body mass index, provided nutrition and health education and resources, counseled on stress reduction and relaxation techniques and helped people sign up for benefits through Arizona’s Medicaid agency. It’s just one of the ways GCU supports the Dream Center, which will benefit from the men’s basketball game on Tuesday, Nov. 25. The health fair was started about three years ago by nursing professor Tammy Hostetler who had noticed a large gap in services for people living on the streets or just released from prison. 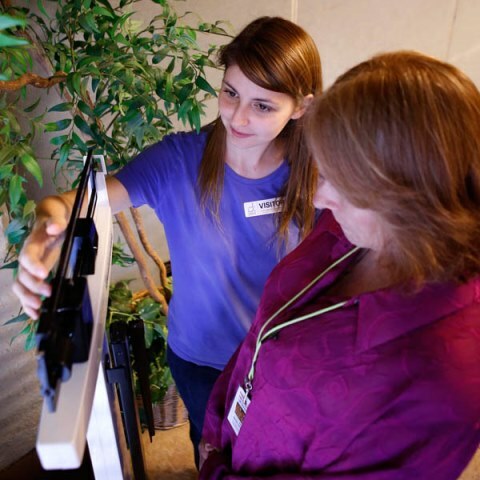 Hostetler thought GCU students could benefit from assisting a population with which they might not have much familiarity and obtain volunteer hours at the same time. Nursing student Dezzera Echesabal measures a client at the Dream Center. Friday’s outreach was a supportive learning environment for Beka Jonas, a third-year nursing student. At one point, Jonas crossed the room to ask Hostetler questions about a man with high blood pressure who said he wasn’t feeling well and was not on medication. Hostetler advised the student to counsel him on dehydration and too much salt in his diet, then to send him to a table for help enrolling in health insurance. Jonas grew up in New Zealand and the Philippines, where health care was not widely available. She decided to go into nursing while working as a cook on a medical ship in the South Pacific that was staffed by volunteer doctors and nurses. “This is very interesting because you’re trying to help them understand why they need to be concerned about their health, not to panic about it, but to own it and to help themselves with simple strategies like going for a walk every day,” she said. Ashley Robinson, a 23-year-old Dream Center resident, appreciated having the chance to talk with someone her own age and gender about some of the severe depression and suicidal thoughts she has experienced. Robinson learned breathing and coping techniques from Courtney Bartolf, a senior counseling major. 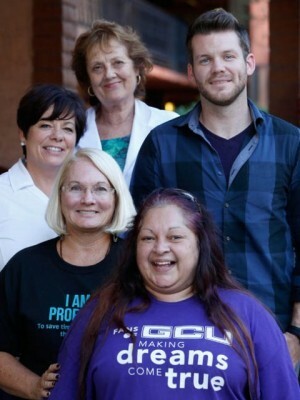 Those supervising GCU’s health fair on Friday at the Dream Center include, clockwise from top, Lynne Larson, adjunct faculty in the College of Nursing; Michael Carroll, a GCU student and the center’s youth director; Terrilynn Gaitan, manager of the center’s Milestones Program; and Tammy Hostetler and Sheila Searles, faculty in the College of Nursing. The health fair gave students the opportunity to experience empathy and step outside their comfort zones as well as to meet people trying to better their lives and be more joyful and fulfilled, said Dr. Noé Vargas, head of GCU’s professional counseling academic programs. Jessica Ament, a senior counseling major, shared some self-care tips with a young woman who just wanted to talk about her son. Ament later told Vargas she wants to organize a committee of GCU students who regularly visit the Dream Center. John Paul Stevens, pastor at In His Light Ministries and a graduate of the Dream’s Center recovery program, helped residents there and people off the street with health insurance, Social Security information and other data at the health fair. When he wasn’t busy with real people, he observed real difference-makers.